Astronaut Ellen Baker (KB5SIX) and Gil Carman (WA5NOM) get ready to work NA1SS at W5RRR as the ISS passes over Johnson Space Center. Looking on are Steven Vander Ark (KC5WKH) and Carolyn Conley (KC5JSO). This was one of the first QSOs W5RRR had with the ISS after it became permanently staffed. Configure our W5RRR satellite station to meet the recommended ground station requirements for ARISS operation. Note that these recommendations aren’t the minimum required to contact the ISS, but based on antenna blockage from ISS structure, attitude, etc., having the higher gain antenna and higher power may occasionally be necessary to acceptably close the link. The station needs to be reliable under all conceivable conditions. Train operators on satellite operations, and log 30 QSOs over FM or linear transponder satellites. This proves the suitability and reliability of the setup. Develop a portable ARISS ground station to transport and setup at local schools for special ARISS events. The old desk has been removed, and the equipment placed on a wonderful new desk. Kenwood TS-2000 is now the prime radio for the ground station, with the Icom IC-275 serving as backup. LNAs for 70cm and 2m antennas have been permanently removed. Given the coax type and length between the antennas and the radio, the performance gain achieved with an external LNA is minimal and inconsequential for ISS and other LEO satellite communications. Linear amplifiers have been removed, as the TS-2000 is capable of 100W output on 2m. SatPC32 set to work properly in User mode (Admin privileges not required). SatPC32 configured to automatically correct for uplink/downlink doppler using non-satellite mode split operation. This is an improvement over the old configuration, as no manual tuning is required to compensate for doppler effect. Uninterruptible Power Supply (UPS) has been donated by Jeff AB4ME. This setup has been shown to be capable of turning the rotor and transmitting/receiving at around 50% duty cycle for well over 2x the duration of a maximum ISS pass. This is necessary to keep the station powered in the event of short or long power interruptions to the shack. Phone patch has been reinstalled and reconfigured for the TS-2000, and has been tested over the air. This is necessary for telebridge events, where schools call into the shack’s landline and are patched in to the radio to talk to the ISS. N3FJP AC log software added to satellite station computer, to log all satellite and ISS contacts. MMSSTV software added to satellite station computer, to decode slow scan television (SSTV) transmissions from the ISS. This was proved out during Cosmonautics day, where the station decoded several nice images celebrating the event, which can be viewed on the W5RRR main website. J-pole antenna secured as backup antenna for IC-275. Will be setup and taken down before/after each ARISS event. Not ideal due to azimuth null, so we are looking to build a quadrifilar helix antenna as a replacement backup, which will provide circular polarization and a hemispherical pattern. Audacity audio editing program installed on satellite station computer to record event audio. For #2, we have not made much progress. 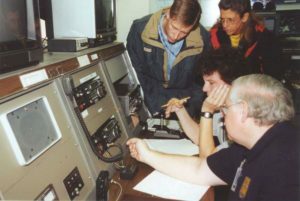 Please, if you are interested in operating satellites and/or being involved with ARISS events, please contact Mike Vandewalle (N8MTV). Depending on the level of interest, one on one or group training sessions will be held as requested. For #3, much work has been completed on creating a portable ARISS station, to be taken to local schools for downlink events. Recently, Jeff AB4ME, operated the station during an ARISS event and recorded some great audio of the downlink. A special Arduino controller has been programmed and wired to interface with an old Kenpro rotor controller, and has proven itself to work well. AB4ME has also recently completed a full calibration of the portable rotor, and provided generator, radio, cabling, tools, software development, and operational support during ARISS downlinks since this project started. Also thanks to Jeff, this portable setup is configured to work with SatPC32 as well as gpredict, and has recently undergone a full pointing calibration. Contact Mike Vandewalle (N8MTV) with questions/comments/suggestions or to schedule a station tutorial!